The story, set in South Africa, follows Alexis (OLGA KURYLENKO) a former agent-turned-thief who, when the film opens, is robbing a bank with three others wearing high-tech suits and voice modulators but was kind enough to have glowing colors to distinguish one from the other. When one of the robbers goes ballistic, he gets shot and killed by Alexis. However, they did get away with countless value in diamonds, along with a USB Flash Drive, and cash but during the robbery, Alexis’ face is seen by the hostages and a sketch is plastered all over the news. Alexis changes her look and goes to the hotel room of former accomplice and former lover, Kevin (COLIN MOSS), who has some sort of fool-proof insurance and the person who holds the passkey to a compromising video, is supposed to arrive. When she does, Kevin has Alexis hide. But this woman is not alone. Those who want that flash drive, led by freelance operative and cleaner Mr. Washington (JAMES PUREFOY), hold her at gunpoint and after deleting the video (of a sexual encounter), torture Kevin for the location of the flash drive all the while Alexis is hiding underneath the bed hearing every blood-curdling scream before he succumbs and dies before revealing any useful information. Alexis manages to escape the room, not before unsuccessfully attempting to kill Washington, does the typical escape and run through the hallways and stairwells of the hotel, where the chase breaks out onto the streets after Alexis steals a car and the bad guys in hot pursuit. After more chases, now on foot, she goes to the only place, that of the other accomplice (AIDAN WHYTOCK) as she is frantic not only to evade her pursuers but to make contact with Luke’s wife and young son who are Washington’s next targets. Momentum is more or less a game of cat and mouse between Alexis and Washington, often with Alexis toying with Washington to get herself to her own end game and taking down The Senator and others involved. 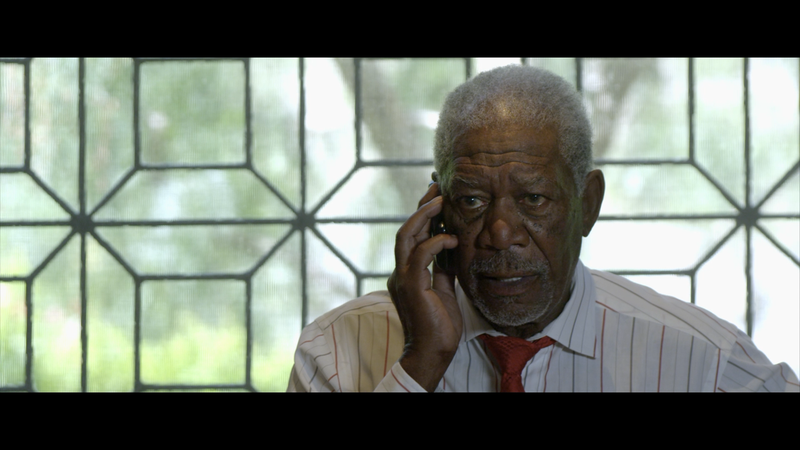 Technically speaking, Momentum is a perfectly adequate movie. It’s shot well enough that you can see the fights, Olga Kurylenko is great as an action heroine and James Purefoy menaces like few others can and basically is portraying something similar as he had on “The Following.” Both give fine performances all things considered while Morgan Freeman, who apparently offered his services after working with Stephen Campanelli when he was a DP for Clint Eastwood and marks his directorial debut here. All in all, it’s the typical “okay” flick. It’s neither good enough nor bad enough to be memorable yet Kurylenko makes it at least tolerable. This is the type of film that is destined to be in bargain dump bins and eventually land on Showtime. All we get is Momentum Behind the Scenes (23:31; HD), a surprisingly lengthy featurette with some on-location interviews with the cast and crew. 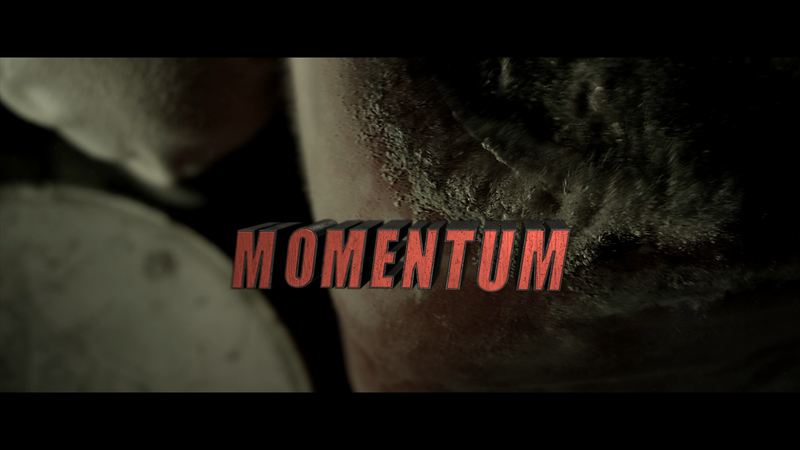 Anchor Bay releases Momentum, barely dressed and barefoot, onto Blu-ray presented with a 2.40 widescreen aspect ratio and a 1080p high-definition transfer. Detail is generally sharp, colors aren’t incredibly bright with some portions of the movie taking place in dark locations yet skin tones appear to be natural. There were no apparent instances of artifacts or aliasing. The movie comes with a nice Dolby TrueHD 5.1 track which provides for crisp and clear dialogue levels but more importantly, the various action and chase sequences picks up giving decent depth with the LFE channel kicking in for good measure. It’s hardly perfect and not nearly reference quality, yet gets the job done making usage of every channel available. 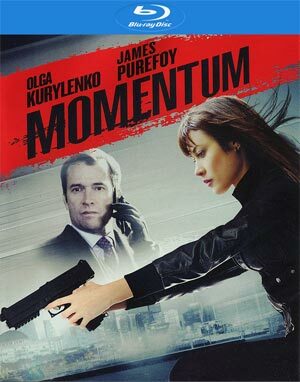 Overall, Momentum isn’t a very good movie but clocking in under 90-minutes, it’s fine for a slow Saturday night. However, my biggest gripe isn’t with the acting, stunts and the like but with the story and how they attempt to make this the first movie of a series; considering the lackluster (to say the least) box office, I doubt a sequel is forthcoming unless the Chinese step in and finance one. As for the Blu-ray, the video and audio transfers are good while the bonus features are limited.